Moveable mouth Does not stand up alone as shown. Yes, you "herd" right; a new Sheep puppet grazes in these pastures. 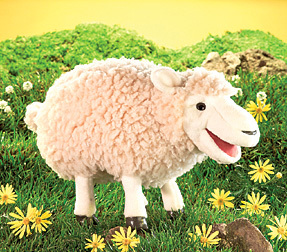 With her sweet, comical face and fuzzy white fleece this is one puppet "ewe" will surely love. Slip your hand in through her chest area to animate her mouth and make her graze and bleat. Measures 19" long.